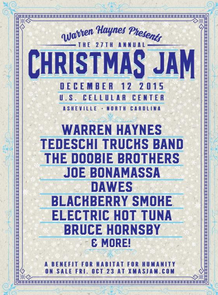 Warren Haynes’ 27th Annual Christmas Jam is back to usher in the holiday spirit and rock Asheville, NC’s US Cellular Center on December 12,2015. One of the most celebrated and longest-running live concerts in the U.S., the Christmas Jam will once again benefit Asheville Area Habitat for Humanity for the 17th year in a row. The proceeds go toward constructing energy-efficient new houses (33 houses have been built to date) as well as purchasing and developing land for entire Habitat subdivisions. The Christmas Jam, which thrives on the generous support of volunteers from all over the country, is steeped in a tradition of surprise collaborations, rare appearances, an array of special guests, and a show so packed with music that the always sold-out crowd heads home just a few hours before sunrise. To mark today, October 5th, as World Habitat Day, the Jam has announced its initial line-up: Warren Haynes, Tedeschi Trucks Band, The Doobie Brothers, Joe Bonamassa, Dawes, Blackberry Smoke, Electric Hot Tuna and Bruce Hornsby. The pre-sale including VIP tickets and travel packages begins October 9th. The public on-sale begins October 23rd. Doors open at 6pm and the show begins at 7pm. More artists will be announced in the coming weeks. “Xmas Jam By Day” events and concerts will pop up around Asheville and “Before The Jam Lend A Hand,” will also be in full force, where volunteers can help build the houses made possible by Christmas Jam donations. Stay up-to-date on Christmas Jam info as more details are announced at the website www.xmasjam.com, Facebook www.facebook.com/xmasjam and Twitter https://twitter.com/xmasjam. Curated and presented by Grammy Award-winning vocalist-songwriter and revered guitarist Warren Haynes, the Christmas Jam is a one-of-a-kind music marathon.Since its inception 27 years ago, the concert has provided an opportunity for the performing artists, audience and the local community to give back during the holiday season. Over the past 17 years, Haynes – an Asheville native – has worked closely with the Asheville Area Habitat for Humanity. The Jam recently handed over a record-breaking half-million dollars, marking one of the largest-ever contributions to the organization. To date, 33 houses have been built with proceeds from the Jam. Because proceeds also go toward purchasing and developing land, donations were also put toward Asheville Area Habitat for Humanity’s newest subdivision Hudson Hills, which is the location of the 2014 and 2015 Christmas Jam houses and will be home to 25 more families upon completion. It was named in honor of Warren and his wife Stefani’s son, Hudson. Christmas Jam’s rich history continues to grow year after year and has seen unforgettable musical moments from past performers including The Allman Brothers Band, Blues Traveler, The Blind Boys of Alabama, Jackson Browne, Phil Lesh Quartet, Coheed & Cambria, Counting Crows, Sheryl Crow, Ani Difranco, Peter Frampton, Michael Franti, Ben Harper, Hot Tuna, Ray LaMontagne, Phil Lesh & Friends, Dave Matthews, Steve Miller Band, Neville Brothers, O.A.R., Grace Potter & The Nocturnals, Robert Randolph & The Family Band, Widespread Panic, John Scofield, Susan Tedeschi, Derek Trucks Band, Bob Weir, Johnny Winter and many more. Ashes & Dust is a musical departure for Haynes and features his most personal songs to date. Asheville Area Habitat for Humanity has welcomed 278 Buncombe County families to safe, decent and affordable houses since 1983. Habitat homes, which are Green Built NC certified, are sold at no-profit to partner families, who pay back a 0% interest loan. The non-profit also offers a home repair program for low-income homeowners. Learn more about Asheville Area Habitat by visiting ashevillehabitat.org. Need to bring back Gov’t Mule as the closer… Warren Haynes band just not rockin the house like the old days!! !